The BMW 3 Series was introduced in 1975 as a two-door, however it was arguably the second-generation version released in 1982, which started what is today a benchmark small executive car in terms of handling and interior quality. 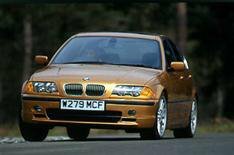 We're going to concentrate on cars built after 1998, when the fourth generation, or E46, 3 Series was first launched. That model came with 1.8-, 1.9-, 2.0-, 2.5-, 2.8- or 3.0-litre petrol engines and a choice of 2.0- or 3.0-litre diesels. A 3.2-litre petrol straight-six M3 came in 2000. It was available as a saloon, estate, coupe or cabriolet, and an automatic gearbox could be mated with every engine in the range. In 2005, the E90 3 Series appeared. It was completely re-engineered with new looks, engines and platform. It came as a 1.6-, 2.0-, 2.5- or 3.0-litre petrol or you could choose between a 2.0- or 3.0-litre diesel with various power outputs. The M3 now got a 4.0-litre V8 engine and was launched in 2007. Once again, the 3 Series was available as a saloon, cabriolet, estate or coupe and every engine could have an automatic 'box. In 2012, BMW launched the sixth-generation F30 3 Series. It features a host of fuel-saving technology, a fresh face and brand new interior. There's a 1.6-, 2.0 or 3.0-litre petrol option, or diesels in 2.0- and 3.0-litre displacements. It's available in either saloon or estate variants and, again, an automatic gearbox can be paired with every engine in the range. Some cars built between September 1998 and April 1999 had problems with their airbags. It is possible that the side airbags will trigger when no accident has occurred. This is down to a faulty safety isolation switch. Cars built between September 1998 and April 1999 are susceptible to braking problems. The connection clip between the brake pedal and the brake servo could become loose. Under heavy strain, it could result in a complete loss of braking. Some cars built between September and October 1999 had issues with their brake lights. The light switch circuits can fail and stay on a continuous flicker or overheat. Cars built between February and May 2001 are at risk of problems to do with their cooling fan. A manufacturing error could cause the electronics to thermally overload and be destroyed. In rare cases this could lead to fire. A selection of cars built during November 2001 had issues with their suspension. The ball bearing in the front suspension strut top mounting might not have been securely fitted. If weight is taken off the wheel for any reason the ball bearing could work loose. Some cars built between November 2004 and January 2005 had issues with their fuel injection systems. The bearings on the high-pressure fuel injector pump can fail, resulting in a stalled engine. A handful of cars built in March 2006 have a problem with their brakes. A faulty greasing system means the sealing ring can be pushed into the brake servo, resulting in a hissing sound in the cabin. Ultimately, this could mean a loss of braking assistance. Convertible models produced between November 2006 and January 2008 could have airbag issues. The connections for both door pressure sensors have been reversed at their connection with the airbag control unit. This could mean the car's side airbags delay in going off. Over 1700 cars produced between May and July 2008 could have issues with their seatbelts. Due to faulty crimping of the component parts of the airbag wiring harness and seatbelt tensioner, either the tensioner or airbag might not trigger in the event of a collision. Some cars built in early 2012 had issues with their power steering systems. Due to a component in the control module not being to specification, it's possible that power steering assistance may fail. A warning light should appear in this case. The majority of 3 Series of this age came with run-flat tyres as standard. Some owners claimed that by changing them to regular tyres the ride was improved dramatically. However, in doing so, it often affected with the tyre sensors, resulting in a loss of pressure readings. Most of these problems should have been fixed for free by BMW, but should you come across anything, always bring it to the attention of the seller.